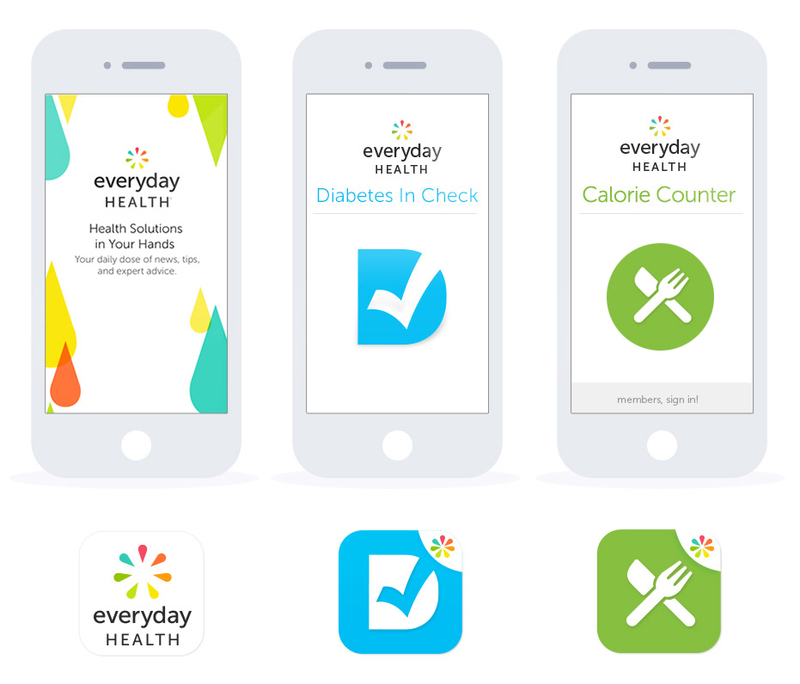 From 2011-2014 I was the Director of Design and UX at Everyday Health where I wore many hats from creative director to hands-on designer, brand maven, ux cheerleader, and more. All the while supporting an awesome interdisciplinary design team of ux, visual and marketing designers. 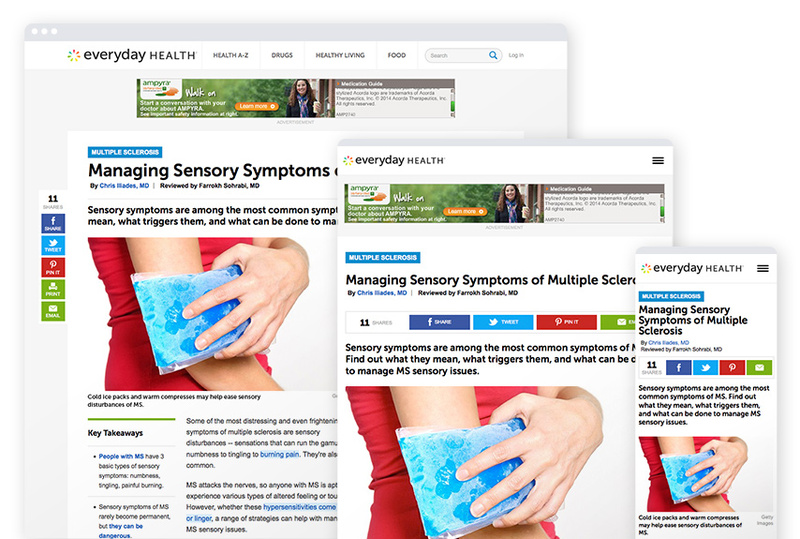 Everyday Health needed to modernize a legacy brand and website in order to gain users trust. Overall project goals were to convert the website to a responsive framework and increase engagement. Establishing business prioritiesSwitching to a responsive framework meant that long established page elements such as ad, marketing and video units would need to find new positions on the page. A prioritization workshop was held with all teams affected to help give visibility into the competing priorities and come to agreed upon solutions. Understanding the needs of the userInitial user testing was conducted by the UX lead to establish pain points in researching condition-related content. From those personas and journey maps were created for a better understanding of the full thought process of the user and to get stakeholder buy in to the decision making process. We developed several iterations of prototypes that were extensively A/B tested to validate product and design assumptions. Some highlights of those findings are below. Addition of an eyebrowMost users were coming in sideways from search engines queries and were not finding related content. We established condition-related ‘eyebrows’ above the content title to link to the overarching topic, creating a visual signpost. The eyebrow concept was carried out consistently throughout the site giving better visibility to condition centers. ThumbnailsSmall thumbnail images next to related articles performed much better than no images, and surprisingly, better than bigger images (which started to feel like an ad). Key Takeaways Most people skimmed the article in order to quickly assess whether it was worth the time to read. Adding a small module of key takeaways from the content allowed them to do this at a glance and they appreciated the time-saving aspect. 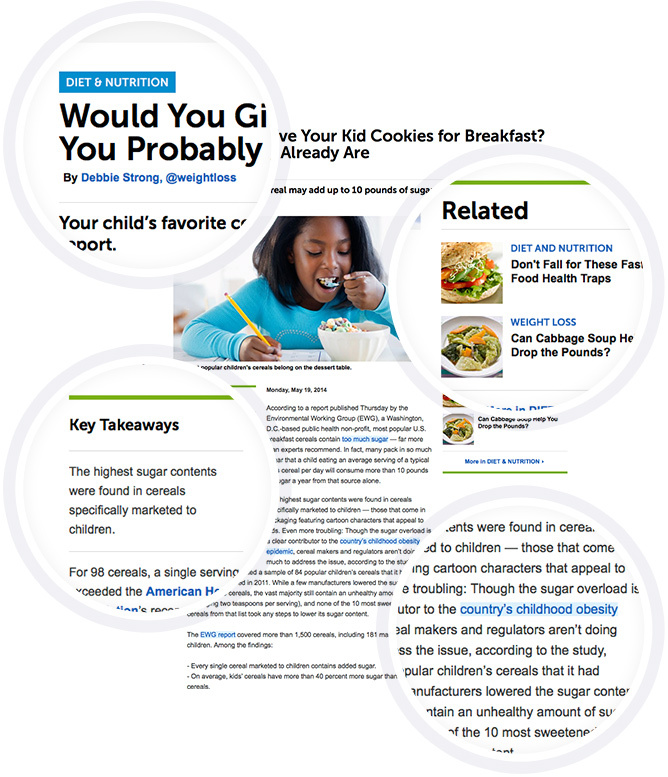 Highlighted Linked Text Improved visibility of links and increased clickthrough to related content. Users saw this as being helpful when performing their health research. 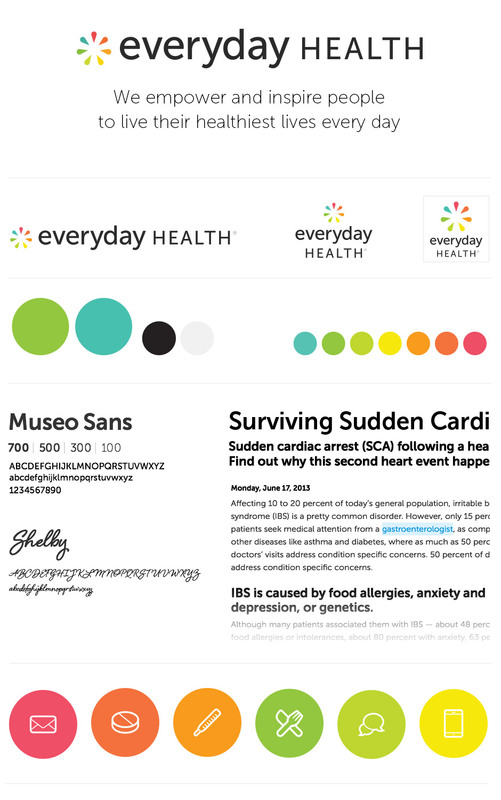 While the website overhaul was being undertaken, I also worked on a visual rebranding of Everyday Health. The goal was to modernize the logo and visual language and apply this to the site redesign. Who are weIn order to gain consensus from executive stakeholders and internal teams, I held brand workshops. Using personas developed by the UX lead we asked teams to consider the emotional state of the personas when thinking about condition-related issues, what value we were providing to them, and how we could differentiate ourselves from other health brands. 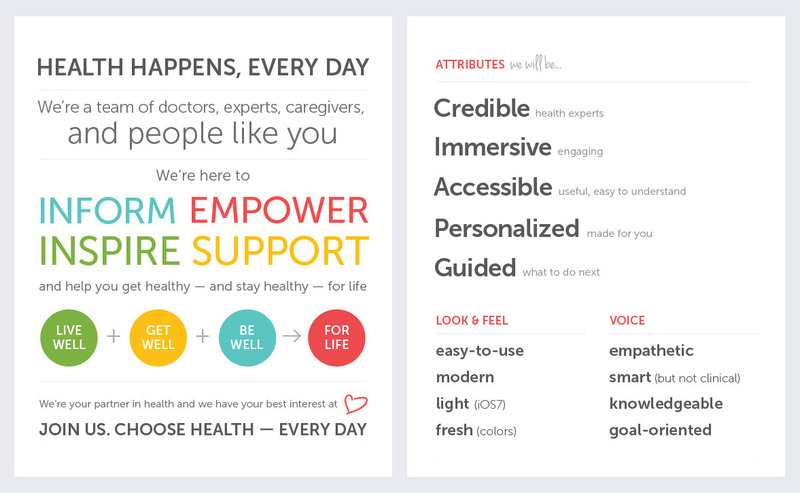 These insights were collaboratively narrowed down and refined to ultimately create a visual brand guide that could be used as an easy reference and reminder to everyone working at Everyday Health. The logo was given a slight update, modernizing the palette and evening out the logo type size for better readability across devices and social platforms. And the overall look and feel was refined with a more narrow and consistent usage of web-friendly fonts and colors. In order to to maintain brand standards across departments and vendors, a 38 page style guide was created and distributed. Design elements were collaboratively aligned across product, sales and marketing design teams at Everyday Health to ensure all our needs were met. Some highlights from the style guide. Sub-brands of Everyday Health also benefited from the brand update.